TAMPA BAY - The Tampa Bay Storm is pleased to announce that defensive back James Harrell has been voted the Arena Football League Most Valuable Player of the Week for his performance in the Storm's 63-28 victory over South Division rival, Jacksonville Sharks. "It is a privilege to receive this honor," said Harrell. "I want to thank my teammates and the fans for all of their support throughout the season." Harrell (5-feet-10, 195 lbs., Arkansas-Pine Bluff) helped lead the Storm to a win over the Sharks in week 6. The Plant High School (Tampa, FL) product made several plays that resulted in a 42-point swing in favor of the Storm, with the Sharks not scoring (-21) and the Storm scoring on each turnover (+21). Defensively, Harrell finished the night with four tackles, three pass breakups, a fumble recovery and an interception. The interception was the fourth of the season and the 10th of his career. He is now tied for the League lead in interceptions (4) and ranks second in the AFL with six takeaways. Harrell's interception came towards the end of the first half, capping off a 21-point swing in favor of the Storm, helping the team go up 28-14. His fumble recovery was in the third quarter and led to the Storm scoring on the next possession. The playmaker also left his mark on special teams when he had a net recovery for a touchdown in the second quarter which gave the team a 21-14 advantage, a lead it would not relinquish. This is Harrell's first MVP of the Week award, beating out Philadelphia Soul defensive back James Romain and New Orleans VooDoo defensive back Tracy Belton. Earlier in the week, Harrell earned the Riddell Defensive Player of the Week award and the J. Lewis Small Playmaker of the Week award. 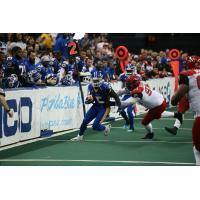 The Five-Time World Champion Tampa Bay Storm is in its 28th season in the Arena Football League. The Storm will host "Military Appreciation Night," when it hosts the Philadelphia Soul on Friday, May 22, on AMALIE Motor Oil Field at Amalie Arena. For more specific details regarding single-game pricing and availability, please contact the Storm ticket office at 813.301.6600 or visit www.tampabaystorm.com. Season tickets can be purchased by visiting TampaBayStorm.com or by calling 813.301.6600. For group sales fans can contact 813.301.6900. Additionally fans and sponsors can follow the Storm on Facebook (Tampa Bay Storm) or Twitter (@tampabaystorm) for up to date news and exclusive content.